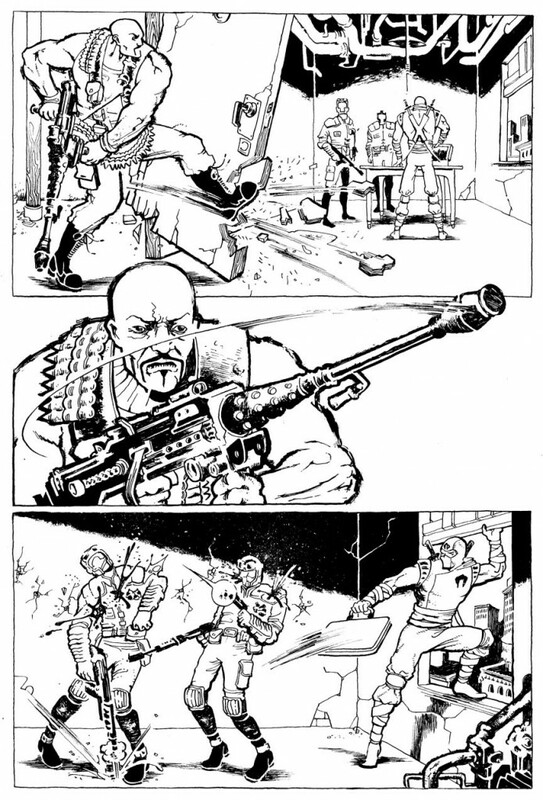 G.I Joe sample pages I staged, pencilled & inked back in 2011. 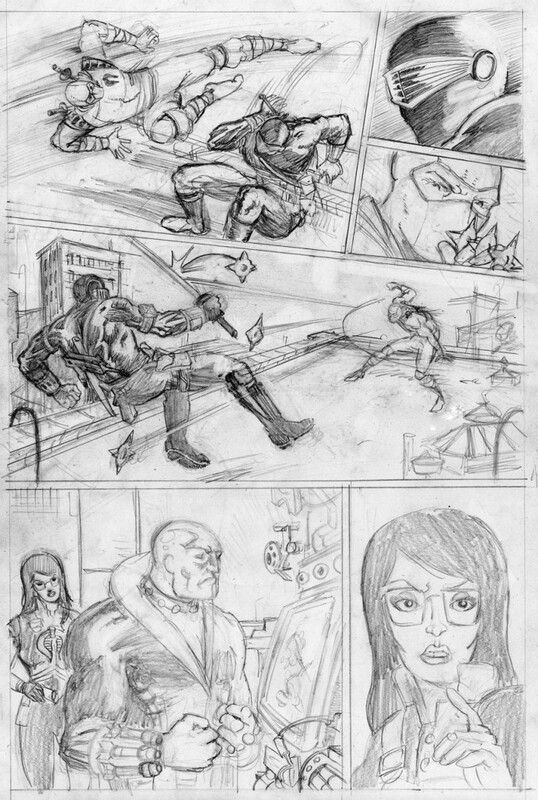 Featured: Roadblock gunning some Cobra Troopers, Snake Eyes vs Storm Shadow, Baroness & Destro being voyeurs. 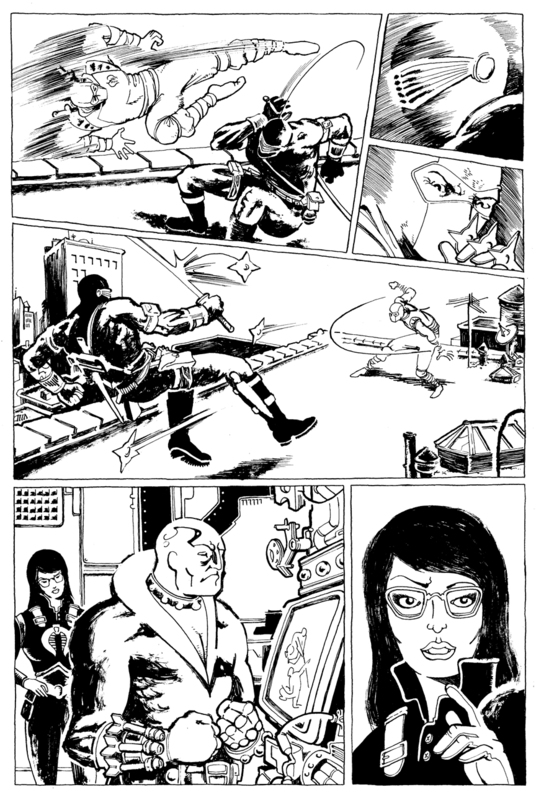 This was pre-Zegas, pre-self publishing, trying to work the work-for-hire hustle one last time before submitting to the notion that cartooning was gonna have to be a hobby. I set my scope to IDW thus (I’d worked for them before & they seemed to hire from a wide spectrum of ability that accommodated relative newcomers). Since G.I. Joe was the only title they published I was [very loosely] familiar with, I drew a sequence I thought would show my “strengths”. I don’t remember whether IDW rejected or flat out ignored my knocking on their door, but thank god they did either way! Not being able to land a job I knew I could crush was becoming my personal industry standard, but I wasn’t gonna let that dopey job get me down (no offense). Hence, Copra Press. Anyway, I think I would’ve had a great time drawing Snake Eyes kick the crap out of anything, actually (and c’mon: Baroness). But as it stands, these pages represent the end of an era and the beginning of a new one. Nice way to look at it, man. I’m still trying to find the silver lining to a promising DC internship that ended up a casualty of the very public 2009 shake-up. I really admire guys like you who found a way to cut out the big guys altogether and still do what you love to do.